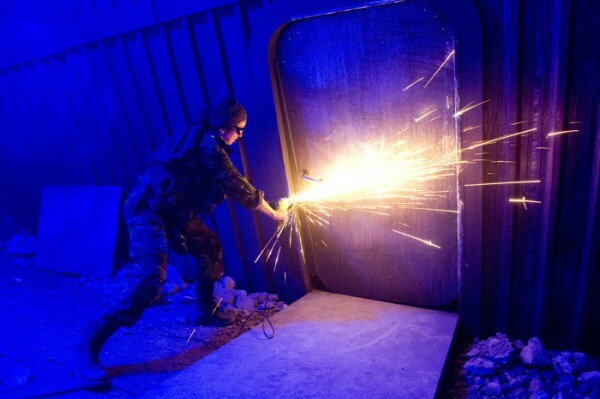 Here’s the question that’s been bothering me since I saw Punchdrunk’s The Crash of the Elysium at the Manchester International Festival: was this a brilliant piece of immersive theatre or just essentially a 3D version of an episode of Doctor Who? Don’t get me wrong; I loved this production, loved it. As a Doctor Who fan I was bound to; like many fans I’ve always wanted to be part of one of the Doctor’s adventures and The Crash allowed that happen – for that it won my heart. And yet I kept wondering if it all wasn’t one big advert for a BBC TV show? Was it Punchdrunk’s innovation I was responding to or a more basic, childlike excitement about getting to enter the Doctor’s world? I still get a warm glow from looking at the crumpled letter from the Doctor that was addressed just to me and remembering the wonderful feeling of companionship that was created in our group of audience members, previously strangers to one another. I’m grinning now as I think about our shrieks and gasps as we fought one of the scariest Doctor Who villains, of seeing the Tardis up close, of being part of an army patrol led by a valiant captain. I’m trying to equate my own delight as a 30 year old adult to that of an even more (though not much more, to be honest) excitable 13 year old or even a brave one of six. As thrilling as I found the whole experience, it must have been incredible to be a child and be part of this. The one sticking point for me is that this was an adventure that anyone could have given us. There’s a Doctor Who Experience raking it in at Olympia in London; is The Crash of the Elysium really very different? I don’t think it is. It’s designed with the fans in mind, and for young fans at that, but perhaps this limits rather than liberates the potential for originality and imagination. Though I love everything Who-related, I wanted more in the way of Punchdrunk’s vision. I wanted them to deviate from the path a bit, to break away from the creation of a real life TV experience and into something more theatrical and unexpected; I suppose I really wanted something more of the Punchdrunk aesthetic to merge with this Doctor Whouniverse. In all honesty I’m not sure how they could have done that, but on the evidence of the genre-bending Adam Curtis-collaboration, It Felt Like A Kiss at the last Manchester International Festival – another syncing of TV and theatre – I feel that Felix Barrett and co might have been capable of pulling it off. The production has so much going for it. The cast are masters of making each team mate feel important at all times and the thrills are undeniably there – for adults and children alike. But I do wonder if there was a degree of complacency at work here, a little bit of laziness – or maybe it’s simpler than that, maybe Doctor Who is just too big and well known, the brand ultimately constrictive to a company of proven imagination.